The ability to do work is known as energy. Anything that is doing something uses energy. Your body needs the energy to walk, think and lift your school bag. We get this energy from our food. All the mechanical objects such as cars, bikes, buses, and airplanes need some kind of energy source like gasoline to do their work. Energy is measured in joules in the international system of units. But, there are also other units of energy like kilowatt-hour. This unit is mostly used is your home’s electricity meters. Your electricity bills are calculated according to the usage of energy in kilowatt-hour. There are many forms of energy including chemical, electrical, heat, light, kinetic, potential and nuclear energy. These different energy forms can be converted into each other. For example, we use electric heaters in winter to warm up our homes. These heaters use electrical energy and convert them into the heat energy. Let’s dig into each type of energy. Chemical Energy: It is stored in the bonds of molecules. When chemical reaction happens, they release chemical energy. We use chemical energy in our car in form of gasoline to drive. Batteries also use chemical energy to produce electricity. Electrical Energy: It is the widely used form of energy. Today it is very difficult to think about life without electricity. We are almost doing every work with electricity. Electrical energy is obtained from the movement of electrons. It is mostly produced from fossil fuels like coal and gasoline. Heat Energy: We use this energy to cook our food and heat our homes during winter. Heat energy is obtained from molecules at high temperature. For example, electrical or gas stoves are used to heat up the pots for cooking food. Light Energy: Light energy is the form energy that we are able to see. Our Earth receives a lot of light from the Sun. Light is also produced by electricity at homes. We can also generate electricity from light by using Photovoltaic cells. Kinetic Energy: Kinetic energy is also known as the energy of motion. If an object is moving, it has kinetic energy. Cars moving on roads have kinetic energy due to their motion. Potential Energy: Potential energy is also called stored energy. Energy stored in springs is potential energy. Also, objects at heights have also potential energy due to the gravity. This energy is released when objects fall. Nuclear Energy: This energy is released during a nuclear reaction; fission and fusion. Nuclear reactions release a huge amount of energy. Many power plants across the globe utilize fission reaction to generate electricity. Energy is classified into two types, one in renewable energy and the other is non-renewable energy. Renewable energy is the types of energy whose resources are not consumed up and can be recycled. Examples of renewable energy include solar energy, wind energy, and geothermal energy etc. Non-renewable energy sources are consumed in the process and can’t be recycled. Examples of this types of energy include coal and gasoline. People have been using wind energy for more than a thousand year. 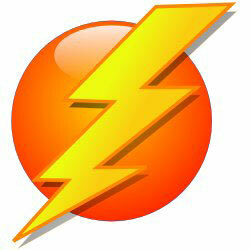 One lightning bolt can power a 60 watts light bulb for six months. Geothermal power plants are used to generate electricity by using the Earth’s internal heat. Abdul Wahab, "Energy," in Science4Fun, April 13, 2019, http://science4fun.info/energy/.